Twitter/@davehclarkAmazon is raising its minimum wage to $US15 an hour for all US workers. Amazon is raising its minimum wage to $US15 an hour for all US workers starting November 1. An Amazon executive broke the news of the change to hundreds of employees at a warehouse in Southern California on Tuesday. 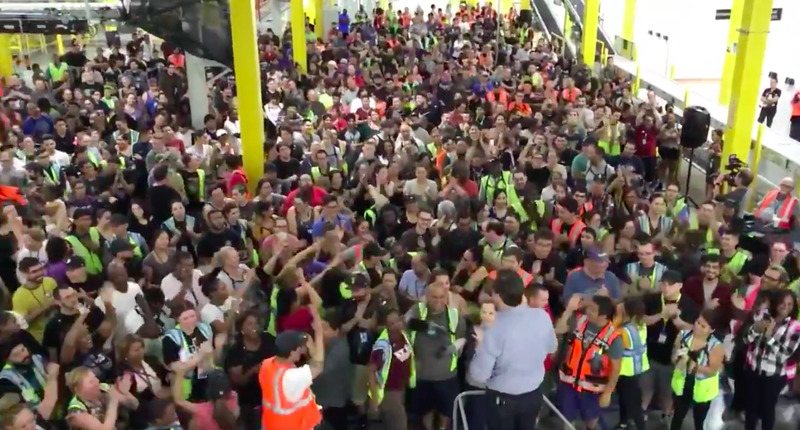 A video of the meeting shows warehouse workers shouting, cheering, and jumping in response. Amazon said on Tuesday that it would raise its minimum wage to $US15 an hour for all US workers starting November 1. The change will affect more than 250,000 Amazon employees, including part-time workers and those hired through temp agencies, the company said. The impact is likely to be felt the most at Amazon’s warehouses, where many of the company’s lowest-paid positions are concentrated. Dave Clark, Amazon’s senior vice president in charge of operations, broke the news of the wage increase to hundreds of employees at a warehouse in Southern California on Tuesday. A video of the moment that Clark posted on Twitter shows workers shouting, cheering, and jumping in response.